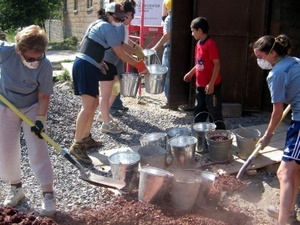 A Global Builders team from New Jersey led by Suzanne Daghlian is working with The Fuller Center for Housing in Armenia June 26 – July 12 to help finish a home for the Arshakyan family. Armavir, Armenia – The Arshakyan family has two teenage children who don’t know what it feels like to have their own house. The half-built home that the family owns was started 10 years ago and is still incomplete. “It is hard to complete a construction of a home and at the same time feed and clothe a growing family,” said Ashot, the father of the family. Now the children, son Gevorg, 17, and daughter Arpine, 15, are building their house with the team members, some of whom are around their age. The Fuller Center for Housing construction manager supervises and monitors the construction work. One of team members, Nelly, visited Armenia for the first time after 20 years of living in the U.S. Originally from Armenia, she has a special reason to be back: to bring her 17-year-old daughter for the first time. Just after the first day in Armenia Nelly and her daughter Gabriella are looking forward to coming back next year. The team has a mixture of first-timers and experienced members. All of them came to help families build their homes. But there is more in it than just the construction. It is the moral support for the families, making more friends and bridges. She was back for the third time, so was her team member Minas Arakelian. A veteran builder, a young teacher named Lori, has been coming since 2002 every single year. While the Fenerjian sisters are here for the first time, they already feel as if they belong in here. “The blood is calling,” Armenians would say. While the Fuller Center for Housing provides long term, zero-interest loans to families to complete or renovate their homes, local and international volunteering helps eliminate the cost of labor. In the future volunteers often return again, or become donors and ambassadors. This year Fuller Center Armenia aims to support 100 families. The need is far more immense than this aim. “Though we cannot help everyone at the same time, we can make a difference by serving one family at a time,” Gohar Palyan, Manager of Programs for Fuller Center Armenia, said. 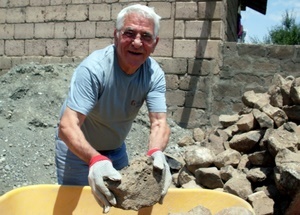 Fuller Center for Housing Armenia will host three more Global Builders teams this summer and fall. For the dates and more information visit here. 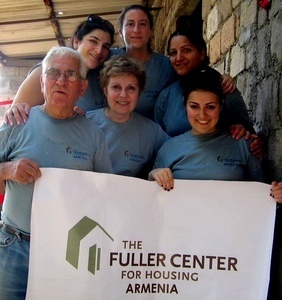 The Fuller Center for Housing Armenia is working to eliminate poverty housing by providing long term, interest free loans and by assisting with the volunteer work helping low-income families to build simple, sustainable, affordable houses and renovate their houses. Read more of their stories here.